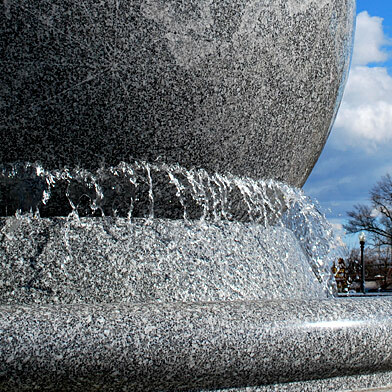 WHAT: Mary Morton Parsons Earth-Moon Sculpture (or Grand Kugel) in Richmond, Virginia. LOCATION: Science Museum of Virginia, 2500 West Broad Street. ARTIST: Kusser Granite Works, Germany. DEDICATION: January 2003, rededicated October 2005. DESCRIPTION: The the $1.25 million sculpture represents the Earth and the moon at a scale of about 1 foot to 1,000 miles. 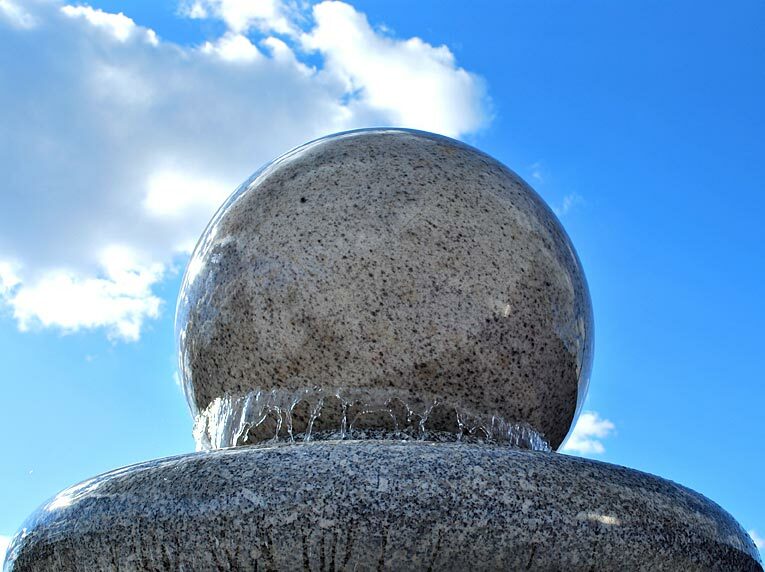 The 29-ton Tarn granite globe Mary Morton Parsons Earth-Moon Sculpture — better known as the Grand Kugel (kugel is German for ball) — is recognized by the Guinness World Records as the world’s largest floating-ball sculpture, thanks to a jet of water. Even little children can move the sculptures, which is a never-ending crowd pleaser for the little ones. The Earth is a solid granite ball almost 9 feet in diameter. A proportionately smaller moon is 250 feet from the Earth. It is 2.3 feet in diameter and weighs about 1,100 pounds. There is a brick path between the two, and it provides a great opportunity to demonstrate distances and proportional size. Another great thing about this feature: Free. It only takes 10-15 minutes to drop by this excellent Very Richmond attraction and never ceases to amaze — at any age. 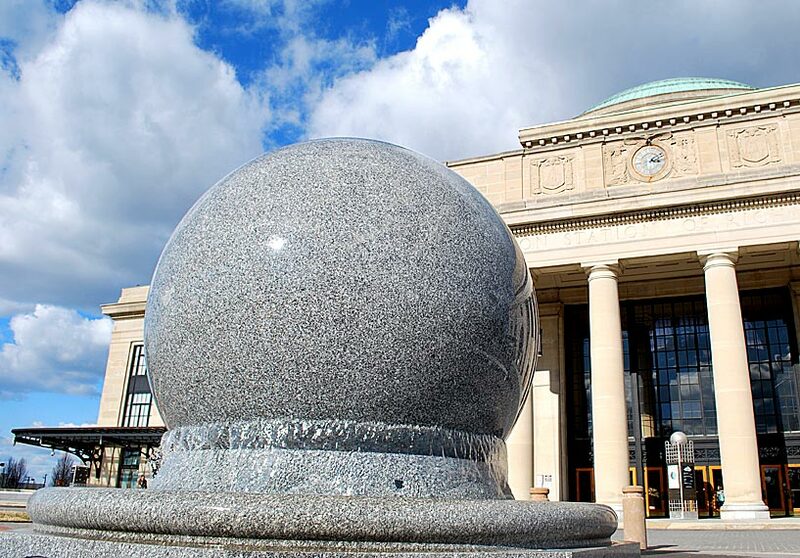 The original Grand Kugel was carved from an 86-ton block of South African black granite. It was 8 feet, 8.7 inches in diameter, and it floated on a base of granite. Soon after installation in 2003, the first Grand Kugel began to crack and was shutdown in 2004. It was replaced in 2005 at no cost the museum, thanks to insurance coverage. What makes something that isn’t even a decade old Very Richmond? Two: Because of its record-holding status, it brings notoriety and much-needed attention to Richmond, Virginia. Three: Didn’t you just read that the first one broke? NOTE: Statistical information came from the Science Museum of Virginia and the Richmond Times-Dispatch.